Where in the World is St. Valentine? Queue self-deprecating, satirical Instagram accounts. It’s that time of year to bite the bullet and relent to social conformity for the Hallmark hell-hole known as Valentine’s Day. How did we come to this? Certainly, there must be more than greeting card companies behind the madness. 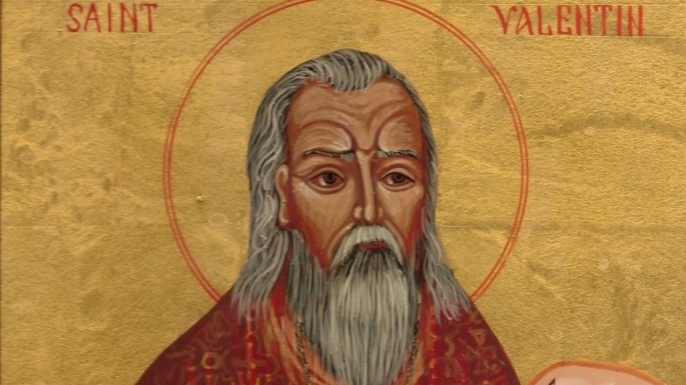 And since this blog is about “travel stuff”, it begs the question: Who was St. Valentine, and where in the world is he? Multiple “St. Valentines” exist, but the one who inspired nice words on chalky candy hearts is actually unclear. We have several options for our journey to locate the patron saint of love. Keep in mind: each of these versions might be true, yet referring to different dudes named Valentine. One legend tells that Emperor Cluadius II of Rome figured his soldiers were better equipped for battle without the burden of a bride. Young men were thus banned from marriage, so they had to tie the knot in secret. Enter Valentine, who performed stealth weddings in the forest. He was then executed for his actions. Another version finds our hero, Valentine, once again at the mercy of Claudius II. Given the opportunity to denounce his faith in favor of paganism, Valentine refused. Before his death, it is said that he restored sight to a jailer’s daughter named Julia. He was then executed for his actions. or this would make, like, no sense. He was then executed for his actions. Chaucer, of “The Canterbury Tales” fame. In 1382, Geoffrey Chaucer wrote Parlement of Foules, a romantic poem that first connected St. Valentine with the celebration of love. This guy is mostly irrelevant to our story, except that it reconciles the varying accounts into the one idyllic saint we celebrate today. You can view the skull of St. Valentine in Rome at the Basilica di Santa Maria. Yet there are at least nine other places claiming to house relics like this. You can find alleged remains of V-tines in Prague, Poland, Scotland, France and the UK. If that’s not enough Valentine’s madness to empty your inventory of Ninja Turtle-themed cards of platonic poetry, cultures all around the world celebrate the saint one way or another. From Singapore to Japan to Romania and Wales, religious or not, some form of the holiday has evolved its way into culture. While I believe the American version has distorted the great gift of love into corporate mockery, it’s nice to think that—amidst all the other crap out there—love is international. To love, is human. I almost barfed in my mouth on about 9 occasions searching stock photos for this article. See (maybe) St. Valentine’s skull with EF College Break.